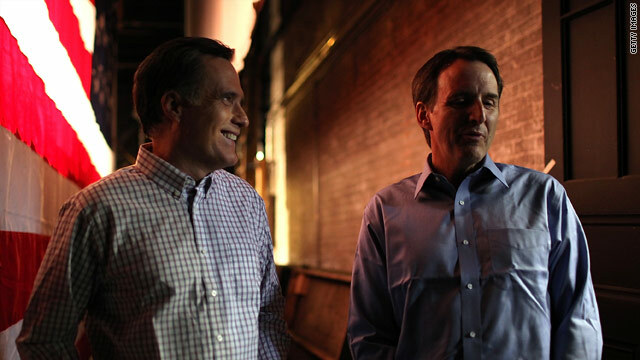 Mitt Romney standing with former Minnesota Gov. Tim Pawlenty, a rumored potential running mate pick. CNN Running Mate Poll: Who are these guys? Washington (CNN) - They don't get a vote, but if they did, who would rank and file Republicans want as their party's vice presidential nominee? According to a new national poll, although there is no favorite among Republicans and independents who lean towards the GOP, Sen. Marco Rubio of Florida, New Jersey Gov. Chris Christie, and House Budget Chairman Paul Ryan of Wisconsin top the list. But the survey indicates that the candidates Mitt Romney may be considering as his running mate are not well known. A CNN/ORC International poll released Thursday indicates that 28% of Republicans would like to see Rubio as the presumptive GOP presidential nominee's running mate, with Christie and Ryan tied at 16% apiece. No other potential running mate tested on the poll, including Sen. Rob Portman of Ohio and former Minnesota Gov. Tim Pawlenty, crack double digits. So who will Romney choose? "When Republicans are asked to put on their pundit caps, Rubio again comes out on top with 30% predicting that Romney will tap the freshman senator, who's very popular among conservatives," says CNN Polling Director Keating Holland. "But again the field is divided. One reason is that the guys on Romney's presumed short list are not well-known to most Republicans, or to most Americans." Although Rubio tops the list, for example, four in ten Republicans and nearly half of all Americans are unfamiliar with him. According to the survey, a majority of Americans are also unfamiliar with Ryan, and a whopping 72% have no impression of Portman. "The good news for Romney: Without a clear favorite in the running, he is probably free to pick whomever he likes without angering a significant chunk of the party. And politicians who are not well known by the general public tend to arrive with very little baggage, giving them the opportunity to make a good first impressions on the public," adds Holland. The CNN poll was conducted by ORC International, with 1,010 adults nationwide, including 419 Republicans and independents who lean towards the GOP, questioned by telephone. The survey's overall sampling error is plus or minus three percentage points, with a sampling error of plus or minus five percentage points for questions only answered by Republicans and independents who lean towards the GOP. I'll tell you that they are a bunch of guys trying to take my welfare money away. I'm so tired of people talking about how bad the economy is and how they hate paying lots in taxes, but I'll guarantee you that you can pay more in taxes. You might have to tighten your belt some or send your kids to public schools but you can pay more taxes. There's families like mine that really need and deserve this money. You take food for granted but we can't. population of the Hispanic community. Rubio is a crook, and a liar. What does CNN know about Obama? His college transcripts? Can't tell if BinaryTooth is seriously whining about welfare, while ON THE INTERNET. Romney won't be able to find anybody as senile and crazy as Joe Biden so will have to settle for somebody that is simply competent and sane. ROBme running mate his "taxes"
Ahh, the picture looks like 2 that are in love. How sweet. Who cares! Repuglican zombies have one taste in their mouthsthe "poor, unemployed, middle class and senior citizens." They will eat all their resources and benefits up with tax cuts for the "rich!" The Bush tax cuts for the wealthiest five percent of Americans cost the U.S. Treasury $11.6 million every hour, according to the National Priorities Project. Between 2001 and the current projected end of the Bush tax cut extension, tax cuts for the wealthiest 5 percent will cost the U.S. Treasury $1.184 trillion. If extended through 2021 as gop lawmakers propose, the total cost will exceed $3.2 trillion. The high unemployement is due to people like romney out sourcing. that's why middle class Americans are suffering so much. Keep voting for Obama but if he gets a second term and your jobs are gone and your house goes in foreclosure, nothing can be done until 2016 but it might too late then. So keep on voting for Obama and become a loser. Rommey himself has shown us he alone is not qualified for the job of President so why would we think any of these no-name Republicans would offer any better. Romney cannot pick a real leader for VP because that person would just show even more clearly what a terrible choice Republicans made with Romney. What bothers me most about Romney is his dishonesty. There is not one issue he has not lied about, not one thing about President Obama he has not run a totally false ad on, and here we are in August and we have NO idea what Romney is FOR on any issue, policy,or principle. I stand with President Obama – a true leader with actual values, character, integrity, solutions, and a true love and hard work demonstrated of and for the American People – ALL of us. Obama 2012 and an all Democratic Congress is how we recover fully. Obstructionist Republicans must go so the President can work with reasonable people in Congress to pass JOBS and Infrastructure, and sane deficit reduction. romney ia a fool and no vp he picks will help. Biden is so far aheaad of any of them in experience. Repos are just sour grapes and it shows. Forward 2012 rich fat cats need not apply. "Keep voting for Obama but if he gets a second term and your jobs are gone and your house goes in foreclosure, nothing can be done until 2016 but it might too late then. So keep on voting for Obama and become a loser." Don't worry...we fully expect taht if Obama wins and the GOP maintains control over the House, they will try to inflict exactly those kinds of tragedies on the middle-class in order to punish us for voting for Obama and ruin Obama's record. In other words, the THREAT that the GOP is to the middle-class is already duly noted. We have not seen Romney's transcripts either? Since both of them are running for president, you should have the same requirement for both of them. Also, don't forget that we are still waiting to see Romney's tax returns for the past 20 years. FYI, he (Romney) may have used IRS Code Section 382 to receive non-taxable income when he acquired distressed companies and used their net operating losses (NOLs).